Cooking With My Food Storage: Can I Make Home Made Yogurt From Freeze Dried Yogurt Bites? Can I Make Home Made Yogurt From Freeze Dried Yogurt Bites? **Update: One of my readers told me that this post is confusing. I'm sorry. Let me clarify. This post is about using freeze dried yogurt bites as a starter to make home made yogurt. If you are a little bit "granola" like I am and make your own yogurt, than it would be AWESOME to use freeze dried yogurt bites as a starter or culture to make your own yogurt. Sadly it does not work well and is not a safe practice. If you just want to reconstitute the yogurt bites and eat like fresh yogurt (which is how they are designed to be eaten) well that is a wonderful way to use them and totally safe. I hope that clarifies things. NO, making yogurt from freeze dried fruit flavored yogurt bites does not work, and is UNSAFE. I have been making my own yogurt for years. When freeze dried yogurt hit the food storage market I tried it and liked it. Immediately I thought “I wonder if I could make my own yogurt with this as a starter?” But I was concerned that the fruit added to the yogurt bites would somehow make the home cultured yogurt unsafe. I decided to give it a try anyway using my tried and true yogurt recipe, substituting yogurt bites for the fresh plain yogurt. I was hopeful that it would work. I turned my yogurt maker on and after the appropriate time went back to check. Sadly the yogurt did not set. But I thought sometimes yogurt will thicken after refrigeration. So I put it in the fridge and waited. Still no set. I contacted Becky Low from the Utah Nevada Dairy council. I asked her if there was a reason you needed to use plain yogurt when culturing your own yogurt. It turns out that there is. Here is her reply. No yogurt should not be made from fruit flavored freeze dried yogurt bites. The yogurt will not set properly and it is potentially unsafe. Yogurt should only be made from PLAIN yogurt. I am unaware of any freeze dried plain yogurt on the market. Purchase yogurt starters from a reliable source and store them in your fridge. I have been purchasing mine from The NewEngland Cheesemaking Supply Company. They have a quality product, although a little pricy. 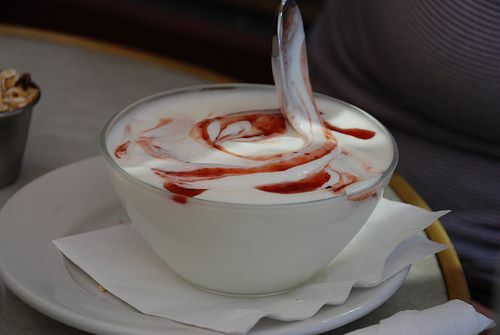 Yogurt can also be made from PLAIN yogurt with live active cultures purchased from your grocery store. Once you have made yogurt successfully you can save a start from it and culture more yogurt.